C. told me off a couple of days ago… She said I incite her to buy too many clothes….I answered that she ought to think it’s worse for me… hours on end looking for clothes on the internet for my posts….I obviously end up buying more than I should! Therefore I decided it’s time to stop buying (as if!!) and it is also time to start using effectively what we already have in our wardrobes. That’s where a little DIY comes in. 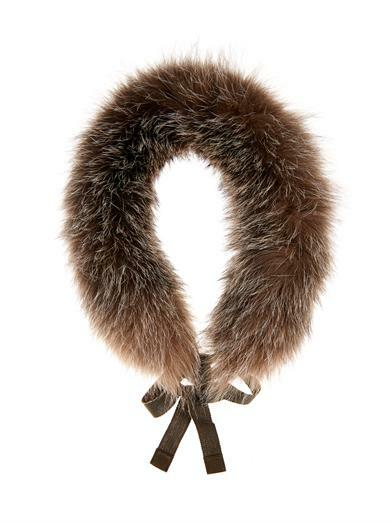 First idea: take an old fur collar and make it something new and exciting. I have one which belonged to my Grandmother, it’s a dark brown fox collar, you know those ones women used to have sewn on to their coats? The fur is still nice, so, I took it to the dress-maker and got her to change the lining which was really tatty. I also asked her to add a thin and long brown velvet ribbon on both sides. The above one isn’t my one, I still have to understand how to upload pictures to this computer!!! It is similar though. The ribbon I had added is a lot thinner and the collar wider at the back and comes in thinner at the front. All in all quite different really!!!!!!!!! Anyway, I think you hopefully will get the idea. Well, since having it done, I have used it very much. The thing is, it is not only a warm “scarf” but also a very chic addition to any outfits, from a casual denim one to a more elegant LBD. I wear it to go out for warmth and end up keeping it on when I take my jacket/coat off because it always looks great with what I have on. I also use it to make an outfit look more expensive. I don’t always wear it around my neck, sometimes it falls nicely off one shoulder or at the back, sometimes I tie it, others I just kind of “scrunch” it into place under my coat’s collar… I hope you get what I am trying to say…. This idea us rather wintery I know, will try to think of something a little more towards spring next time. If your Grandmother didn’t have one you can always try vintage (sorry, I am getting you to spend again…). This entry was posted in DIY, Something special and tagged clothes DIY, fur collar by stylepointofview. Bookmark the permalink.